This a "soft-firewall" package. Its purpose is to help people prevent unauthorized access to routes by IP address. It is able to keep track of IPs, countries and hosts (dynamic ip), and redirect non-authorized users to, for instance, a "Coming Soon" page, while letting whitelisted IPs to have access to the entire site. 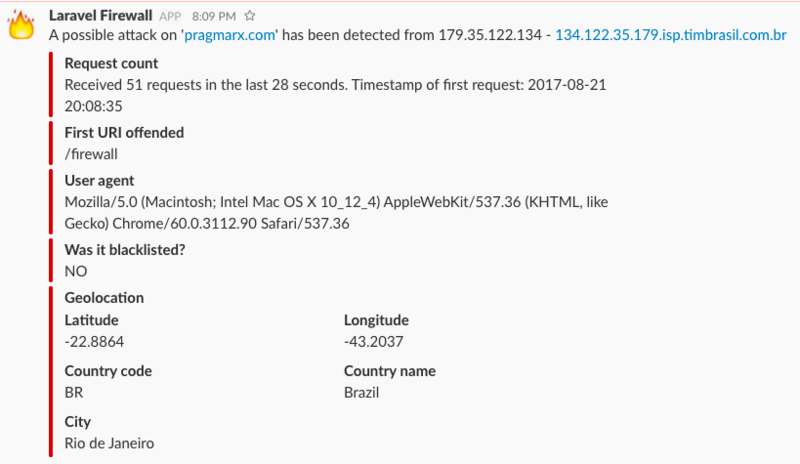 It is now also able to detect and block attacks (too many requests) from single IPs or whole countries. This package can prevent some headaches and help you block some access to your apps, but cannot replace firewalls and appliances, for attacks at the network level, you'll still need a real firewall. Control access to routes and groups via black and white lists. Detect and block attacks to your application, from IP addresses or countries. Send Slack notifications in attack events. Allow whitelisted to access the whole site and send everyone else to a "coming soon page". Redirect blacklisted users to some other page. Use database or arrays to store IP lists. Whitelist your development machine using a dynamic DNS host name. Done using middleware, so you can protect/unprotect groups of routes. All features are available for hosts, IP addresses, ranges of IP addresses and whole countries. Super fast, less than 10ms increase in each request. All IP addresses in those lists will no be able to access routes filtered by the blacklist filter. Access blacklisted routes even if they are in a range of blacklisted IP addresses. Access 'allow whitelisted' filtered routes. If a route is filtered by the 'allow whitelisted' filter and the IP is not whitelisted, the request will be redirected to an alternative url or route name. 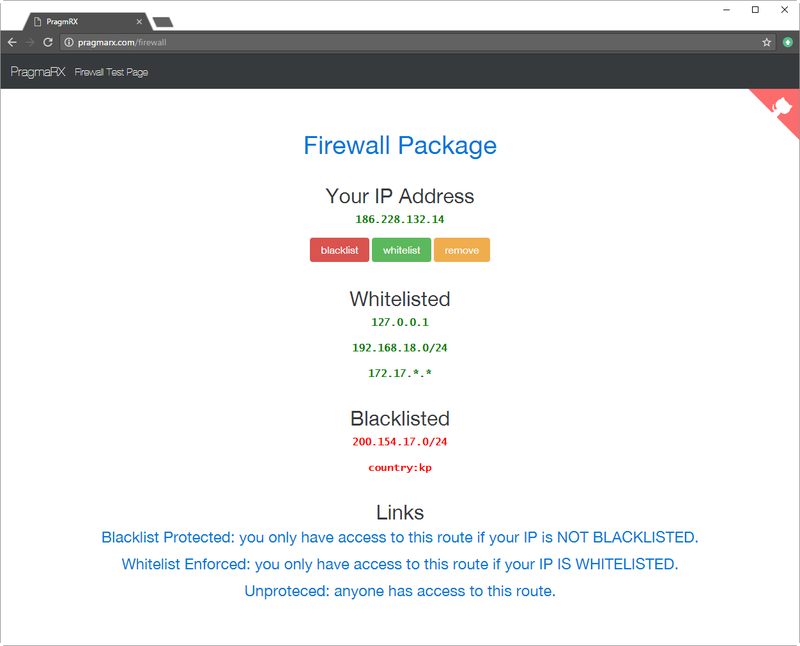 firewall:list         List all IP address, white and blacklisted. firewall:updategeoip  Update the GeoIP database. firewall:blacklist          Add an IP address to blacklist. firewall:clear              Remove all ip addresses from white and black lists. firewall:remove             Remove an IP address from white or black list. firewall:whitelist          Add an IP address to whitelist. Click here to see it working and in case you need a help figuring out things, try this repository. You don't have to do anything else, this package uses Package Auto-Discovery's feature, and should be available as soon as you install it via Composer. Or you could use both. In the following example the allow group will give free access to the 'coming soon' page and block or just redirect non-whitelisted IP addresses to another, while still blocking access to the blacklisted ones. Note: You can add other middleware you have already created to the new groups by simply adding it to the fw-allow-wl or fw-block-bl middleware group. Warning: If you already have a Firewall package installed and migrated, you need to update your migration name, in the migrations table, to 2014_02_01_311070_create_firewall_table, otherwise the migrate command will fail tell you the table already exists.